"Fungal overlord" isn't a job title you see every day on LinkedIn unless you're linked to Matt Gretton. Gretton, environmental studies '13, is the owner of Trifecta Mushroom Co. where he cultivates and sells gourmet oyster mushrooms. "This had nothing to do with my major," said Gretton. A mycology class taught by Dr. Thomas Horton in the Department of Environmental and Forest Biology sparked Gretton's interest in fungus. "I thought it was fascinating. We went on forays to some really unique areas around Central New York like Nelson Swamp that have tremendous variety of wild mushrooms. He also brought in specialists to show us the cultivation side of it. " One of those presentations kicked Gretton's interest to the next level. Mushroom cultivator Owen Tallman from Hamilton did a workshop showing students how to assemble bags of material that included sawdust, coffee grounds, gypsum and a "super special mystery ingredient" and inoculate them with mushrooms. "We were able to grow them right in our kitchen," said Gretton. Gretton contacted Tallman after the class and got a job as his lab assistant using the knowledge he gained in class. That experience gave Gretton an insider's look at what it takes to run a small cultivation business - of what works and what doesn't. A member of ESF's Green Campus Initiative (GCI), Gretton applied for the group's sustainability grants and received $1,000 toward mushroom production. Gretton also visited an aquaponics farm, Main Street Farm in Cortland, and noticed an unused portion of the facility would provide the perfect environment for growing mushrooms. The space above the fish tanks had the high humidity, controlled temperature and oxygen exchange - the "magic triangle" - for growing mushrooms. "I talked with the owners and they agreed we could test it out," he said. "It sounded good in theory, but I wasn't sure if it would work in fact." And in fact, it did work. "I built shelves, put together mushroom bags and they grew like crazy," he said. Having learned about Syracuse University's RvD IDEA business plan competition from fellow ESF alumnus Michael Amadori, Gretton developed a business plan for his own mushroom business. Using the photos of his working model in Cortland he submitted a proposal to expand his one-shelf operation to a full setup. He won $10,000 and competed at the state level..
Not only is Gretton in partnership with Main Street Farm, he's also working with the Tech Garden in Syracuse to fine tune his business plan. Through the business incubator, Gretton has access to people who can provide assistance with starting a business. "There are three parts to the mushroom business," he said, listing them: "The labset up to do the fiddly science side of it. The fruiting space, and the ability to get the mushrooms packaged and out to consumers along with payment and delivery." Gretton said he has the bases covered. "Working with Main Street, I get that fruiting space for free. They also identified all the restaurants that want to buy extremely high-quality, fresh, local produce which is exactly the market that I want to sell my mushrooms to." "I grow all the mushrooms I can," he said. "They buy the mushrooms from me then retail them to their network of customers, so I don't have to handle the payment collection or delivery logistics myself. I just have to grow the mushrooms, pick them, package them and collect the check." One would hope a fungal overlord would not only profit from his subjects, but also love them and Gretton is definitely a fan. "I love mushrooms. You can use them in stir-fry, make mushroom risotto, make stew, dehydrate them, powder them and use them as batter. The oyster mushrooms also make excellent chowder because they have a little seafoody taste." And if you're looking for a quick something to whip up with mushrooms, Gretton suggests a saute of mushrooms, olive oil and onions. "Then you can use it as a topping for anything, or you can just put it on toast." Gretton has returned to the ESF campus to guide the next batch of mushroom growers. 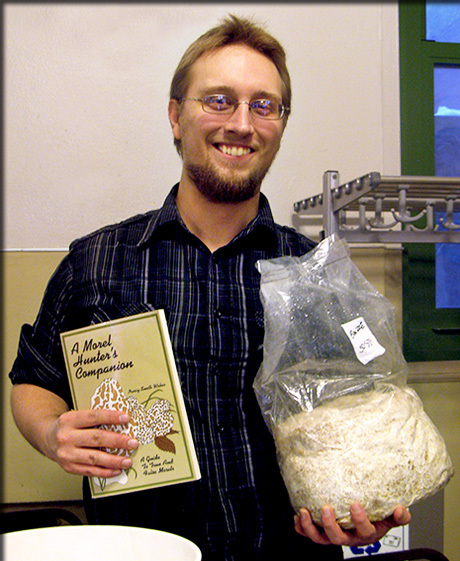 He recently "headlined" at GCI's Fungal Festival where students learned how to grow mushrooms at home. He's also starting a monthly mushroom subscription with delivery on campus. There is one mistake people make with mushrooms, Gretton said, and that's washing them. "You should never wash them - they get super soggy," he said. "You should brush them as best you can." Gretton encourages people to branch out and try different mushroom species. "The U.S. is pretty mushroom phobic, all they know is button mushrooms and portobellos. What they don't realize is portobello, cremini and baby bella are all the same species but picked at different stages of their cultivation. So if that's all you're eating, you're only tasting one species. There's a ton of different species and they all taste different. I encourage people to give it a try."